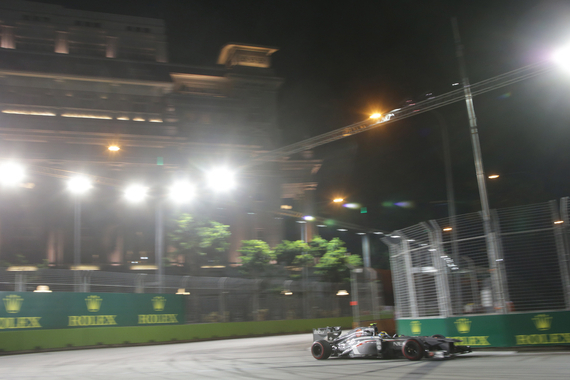 Esteban Gutiérrez expressed his delight after qualifying in tenth place for the Singapore Grand Prix. Gutiérrez made it through to Q3 for the first time in his Formula 1 career and admitted that it was a special feeling. "To qualify tenth is a really special feeling and one that I have missed," he said. "I enjoyed every part of the qualifying. The result today was very important, because it’s not fun going into qualifying knowing that you can be around the top ten, but not getting there. At the beginning, it looked a bit difficult today, but I was pushing myself in practice and communicated well with the team." "We decided that, in order to make the next step, we need to be more aggressive and be more on the edge." Gutiérrez opted not to run in Q3 in order to save tyres. "I think tomorrow will be a tough race. Tyre degradation will be critical and we need to consider that. We usually have a good race pace and also had that in FP2 yesterday. I’m confident we can push for points tomorrow." Team-mate Nico Hulkenberg will start alongside Gutiérrez in eleventh place and believes a DRS problem cost him a slot in Q3. "Qualifying went really well up until the last lap of Q2," he said. "I had a problem in sector one on the DRS straight, as my DRS didn’t open in time. I lost a good two tenths there, which would have put us into Q3. We need to look into that now and find out why that happened." "As overtaking is quite difficult on this track, it is going to be a difficult day tomorrow. Overall it seems we have made a step forward over the past couple of races, and I hope we can continue that positive trend tomorrow."